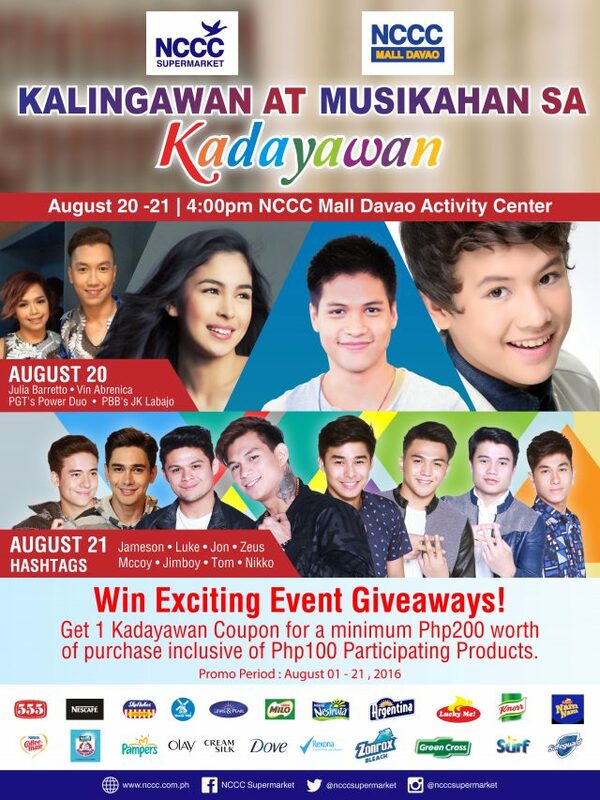 Home Advisory NCCC to heat up 31st Kadayawan Festival with Kalingawan at Musikahan Revelry! It’s the most anticipated Kadayawan celebration this 2016 as the whole nation looks to Davao as the hometown of 1st Mindanaon President Rodrigo Duterte. Known as Davao’s homegrown retail store, NCCC Supermarket and NCCC Mall Davao gear up for the celebration. “We know that all eyes will be on Davao for this year’s Kadayawan that’s why we made the activities extra special because we want to give Dabawenyos more reasons to have fun!” explained Marketing-Public Relations Head, Janna Mutalib. This year’s Kadayawan will bring together musicians, dancers and celebrity artists for a combination of fun, great performances and of course, kilig moments. On August 20, Julia Barretto, Vin Abrenica, Plipinas Got Talent’s Power Duo and The Voice Kids turned PBB Housemate, JK Labajo take center stage at the NCCC Mall Davao Activity Center. The party continues on August 21 with It’s Showtime KILIG AMBASSADOR Male Group “#HASHTAGS”. “The theme embodies the Kadayawan Spirit of coming together, expressed through music and artistry. NCCC wants to give to the community a noteworthy celebration especially that our former mayor is now the President of the country. It’s also another way of paying homage to our beloved President Duterte. We would also like to present our Choice Mart Ambassadress Inday Sara who is also our respected City Mayor this Kadayawan,” shares Darleen Relaccion, Store Manager of NCCC Mall Davao Supermarket. Apart from the culminating shows, another highlight is the Raffle Promo where shoppers can win event giveaways. Starting August 1 until 21, shoppers get a shot at winning by buying groceries worth at least P200 with selected items. Dabawenyos may avail of this at our stores in Maa, Uyanguren and Matina. Throughout the month of August, Dabawenyos will be treated to a variety of shopping delights. To name a few, Diskwento sa Sweldo and Fresh Madness on August 15-17 entitles shoppers to avail of discounts; Fresh of the Season Picks highlight Davao fruits and fresh produce; Sulit to Buy bundled packs reward shoppers with at least 20% savings plus NCCC Supermarket Associates will showcase their talents in a Neo-Ethnic Dance Competition. “NCCC is very appreciative to the people of Davao City. This is where NCCC has started, our roots to the community are deep and lasting. So all of our efforts is really just to show that NCCC is in solidarity with the people. What better way to convey our gratitude than throwing a grand big bash this Kadayawan!” stated Jojo Canda, the Vice President for NCCC Supermarket. Don’t miss out on the Kadayawan Hype throughout the month-long celebration with the mall-wide sale and different pocket events all intended to honor Davao City’s biggest annual festivity. This event is brought to you by NCCC Supermarket and NCCC Mall Davao – In partnership with Downy, Safeguard, Pampers, Olay, Century Tuna, 555 Tuna, Argentina, Nescafe, Coffeemate, Bear Brand, Milo, Nesfruta, Lucky Me, Skyflakes, Namnam, Dutchmill,Green Cross Alcohol, Axion, Zonrox, Lewis & Pearl, Surf, Rexona, Creamsilk, Dove and Knorr, Lewis and Pearl, Greencross Alcohol, Greencross Bath Soap, Zonrox and Axion.